A leather tray purse for coins similar to TP-2. 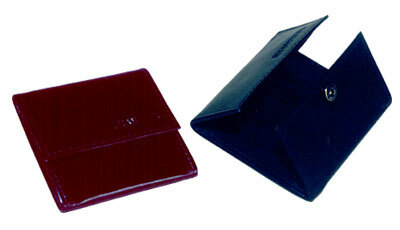 It is of size 7.5 x 7 cm with a 2.5 cm thickness for the coins. The inside is lined with leather foam and is shut with a press button. It is ideal for the elderly and car drivers who need a quick grab for coins to pay the parking meter or toll. The model can be made in different types of leathers like Cow Polished, Cow Nappa, Cow Vegetable, Buff Resin, Buff Glazed, Buff Vegetable and Cow Softy. The colours available are black, blue, brown and shades of cognac and burgundy. 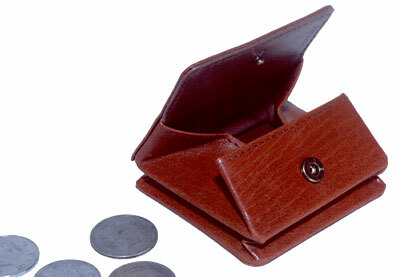 Another type of a leather tray purse for keeping coins. It is of a size 8 x 8.5 cm. The model can be made in different types of leathers like Cow Polished, Cow Nappa, Cow Vegetable, Buff Resin, Buff Glazed, Buff Vegetable and Cow Softy. The colours available are black, blue, brown and shades of cognac and burgundy.